Lowdown: Selected teens are forced to fight one another to the death in a televised tournament. A YA oriented story where teens are having to fend for themselves while the adults are not around to help (or are actually the cause of the problem) has been reviewed on these pages before through the movie Tomorrow, When the War Began. I had a lot against that film, but does The Hunger Games – this time an American attempt to take a successful YA book franchise to the big screen – fare any better? 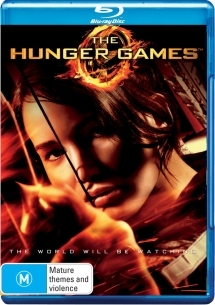 Our heroine for the duration of this two hour plus movie is Katniss (Jennifer Lawrence), a teenager living in some sort of a futuristic, perhaps post apocalyptic, world. People around her are living off poorly and have to make significant effort in order to acquire basic foods. Lucky for her, she is good with her bow and arrow, so she is able to acquire some game. Unlucky for her, her little sister is picked to represent their ward in the annual Hunger Games. The Hunger Games are a yearly tournament featuring two teen representatives from each of the twelve wards. All are convened at one enclosed and heavily televised area where only one contestant can come out – and only after all the rest are dead. Katniss wouldn’t let her sister be led like sheep to the slaughter; she volunteers to take her place instead. Our heroine is then taken to the luxury of the (capital?) city, where people fashioned to look like grotesque images of Marie Antoinette and her royal compatriots live a life of abundance. An abundance made possible through the suffering of the wards but enforced through the Hunger Games tournament. At this point I had to ask myself whether I find the whole setup to make sense. The quick answer is a no! I get the whole 1% living off the 99% thing; I also get the abuse of the younger people pitted into the death matches so that the adults can enjoy the spoils – that’s what pretty much every army in the world does. I even get the whole reality TV as an exceptional case of voyeurism. I do not, however, get how making representatives of the wards kill one another is going to hold the wards back from rebelling; I think it is pretty obvious the exact opposite would be achieved. Thus you would get zero points for guessing what happens next in our film. Armed with the advisory services of an ex Hunger Games winner (Woody Harrelson) and a fashion stylist (Lenny Kravitz), Katniss lights the world on fire, literally. Then the games start, and she finds herself romantically involved with her ward partner, Peeta (Josh Hutcherson). Will she be able to kill him and rub humus off her plate with his dead body? Better yet, will Katniss survive and emerge the winner? As stated already, there is a lot to be said in favor of The Hunger Games, starting with its choice of a female hero for a change. The problem lies with where the film ends up taking its potential to, and those whereabouts are pretty much the usual Hollywood neighborhood of undeveloped single dimension characters (everyone lives up to their stereotype, nothing more and nothing less), irrational decision making and very artificially flavored endings. There isn’t the stench of xenophobia that came out of Tomorrow, When the War Began, but as an artistic statement The Hunger Games is no better. Overall: Promising potential turned into yet another one to fit the mold. 2.5 out of 5 stars.